Season One of the World’s First Autistic Zombie Apocalypse Novel is Complete! Just 99 vents for each of five episodes or grab the discount and get all of Season One for $3.99. Season Two arrives in September. Grab Season One now. I think this storyline is brilliant. It’s not your cliched, run-of-the-mill zombie apocalypse story. It’s character driven. It’s cerebral. It’s awesome. 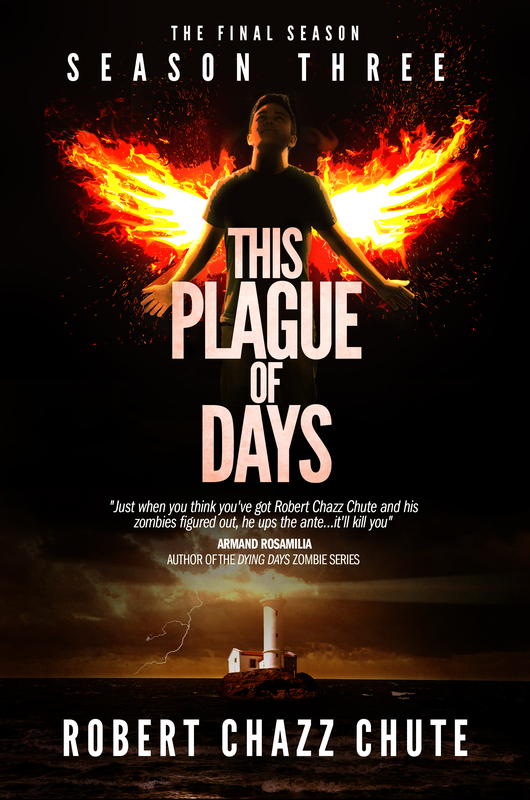 The first episode of This Plague of Days is the perfect balance of back story, anecdotes, and the events of the present crisis. Jaime, the main character, is fantastically written and surprisingly well thought out. His diagnosis on the Autism Spectrum (formerly known as Aspergers), combined with his synthesesia (seeing emotions as color-auras) is a fresh aspect to an otherwise well-known genre. Reading on, I admit I was nervous that the remaining episodes wouldn’t pack the same punch. I was wrong, they did. Jaime is an infuriating character to withstand during such a terrifying predicament-which is why he’s awesome. You find yourself screaming at the page for him to speak up, to warn others to what he sees. And that’s when you realize just how invested in the characters you are. And his isn’t the only well-developed character. Chute often provides glimpses into the pasts of some of the others and it’s so well-written, you forget for a moment that the world is in turmoil…but just for a moment before you’re clobbered over the head again with suspense, tension, and terror. In the end, all the immediate conflicts were resolved in a satisfying way, not rushed, not unrealistic. There’s plenty of ground to cover next season, and the last few lines will leave you guessing and impatiently waiting for Season Two of This Plague of Days. This Plague of Days scares me to death! I just can’t put it down; I have to see what happens next. Bring on Season Two! The book I lost a job for…and why zombies? I will say that my horror serial begins with one plague that spirals society down as the virus mutates. The Sutr-X virus evolves, things get worse and, of course, the world will never be the same. There are great human losses to both strains of the virus. Jaimie and his family face illness, death, danger and betrayal. Worse? The pandemic wasn’t an accident of Nature. There’s an awesome villain and a group spreading the virus for purposes they consider noble, right and true. As the book unfolds, terrorism and the plague’s evolving horrors stretch across the world. A new strain of Sutr-X rising in Britain puts vast forces on a collision course with the little family from America’s midwest. 1. He’s on the autistic spectrum. 2. He is a very shy, selective mute who must hold his father’s hand when they go out in pubic. 4. His special interest is Latin phrases and English dictionaries. 5. He’s in his own world. 6. Jaimie is a boy who sees significance in every detail and every word. He often gets lost in those details and so seems oblivious to danger. When the Sutr plague strikes, stress and circumstance bring Jaimie closer to our world in surprising ways. When worlds touch, they ignite sparks that let his family and the reader glimpse his mind and true abilities. But why pit this strange boy against a world filled with nasty survivalists and infected, rage-filled cannibals? I could tell you that high stakes and steep odds matched against a charming underdog in a tough conflict makes for a compelling story. But you already know that. The simpler answer is, I’m a bit strange, too. I do not have Aspergers Syndrome. I do, however, see the world askew and you’re going to love the odd word excursions almost as much as the zombie attacks, evil villain and my strange plague apocalypse. This Plague of Days launches soon. I love surprising readers. I will. 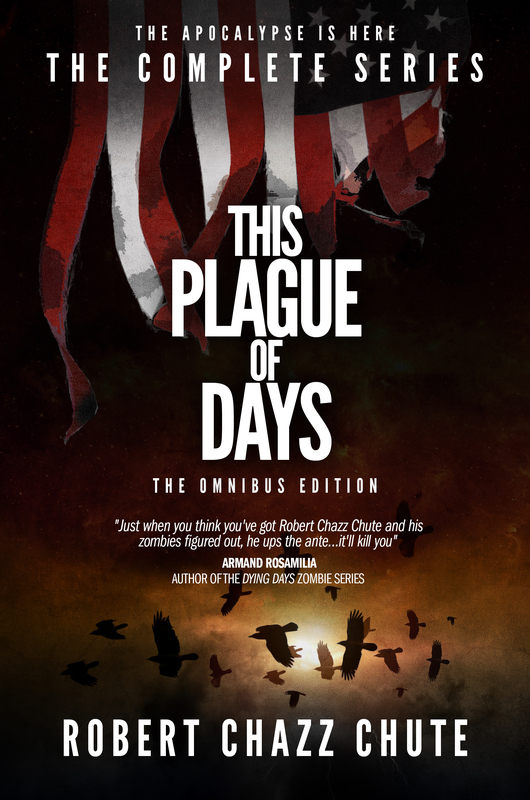 Until the Sutr Virus hits here, click to read other books by Robert Chazz Chute. Just sayin’. This horror serial is about an autistic boy trapped in The Stand and trying to survive 28 Days Later. I’ll have a cover blurb from horror author Armand Rosamilia. In a future that could begin any day now, a virus of mysterious origin begins its lethal outbreak. The first wave kills millions. The second wave is a weaponized mutation that ups the stakes by turning ordinary survivors into cannibals. This is the zombie apocalypse you can believe in. The brain of the story is a villain like you’ve never encountered: the visibly pregnant British woman in a red dress. She is an eco-terrorist who calls herself Shiva. She’s out to make history and a new future by a massive cull of Earth’s worst infection. You’re the infection: Your car, your technology and your conspicuous consumption. Don’t take it personally. To defend the Earth, genocide is Shiva’s answer to global warming. Killing Queen Elizabeth and her Corgis is just the delightful start. The heart of the story is Jaimie Spencer, a sixteen-year-old American boy on the autism spectrum. He’s a selective mute with an obsession for English dictionaries. His special interest is Latin phrases, but it’s Jaimie’s hidden gifts that become the surprising key to his family’s survival. To live, they must face the ravages of the Sutr virus, looters, plague profiteers and cults. Worse? This Plague of Days zombies are fast. Who is This Plague of Days for? Horror fans and anyone with a pulse who wants theirs to beat faster. Young men and women embracing existential angst will get hit between the eyes. The autistic community and their families will love it. From the beta read team, the women love Jaimie and the relationships of the family under siege. The men can’t get enough of Shiva since she’s deliciously wicked in her ruthlessness with men’s hearts and minds. This book also has a lot of fun with language. There are more Latin phrases than Harry Potter had spells, so this one is also for the word nerds. It’s time we hit the world with an oddly cerebral zombie apocalypse. I want to be especially generous with Season 1 to get every horror fan on my crazy train. Jamie Spencer is a 16-year-old boy with Aspergers who sees things no one else can see. He’s obsessed with words but he’s a selective mute. When the world flu pandemic hits and kills billions, you want Jaimie on your side. As the plague spreads, Jaimie’s family hide in their little corner of suburbia, wondering how long their supplies will last. The Spencers must stand together to face societal collapse. They must walk together on an incredible journey to find safety from the Sutr Virus’s slaughter and evade nature’s tyranny. Other survivors present the worst terror to come. Not everyone will make it.